Marking the centenary of the author's birth this text presents three classic comedies. Giddy, elegant and magnanimous in their appreciation of human vice and folly these plays are Noel Coward at his best. his Song at Twilight discussed homosexuality, a subject that he had evaded throughout his career. A juvenile prodigy, Coward was by turns actor, director, composer, lyricist, autobiographer, and author of nearly 60 theater pieces. He even wrote screenplays, notably for In Which We Serve (1942) and Brief Encounter (1946). Although he specialized in light comedy, the so-called comedy of manners, he worked in many forms including patriotic spectacle, revue, musical, farce, even the problem play. 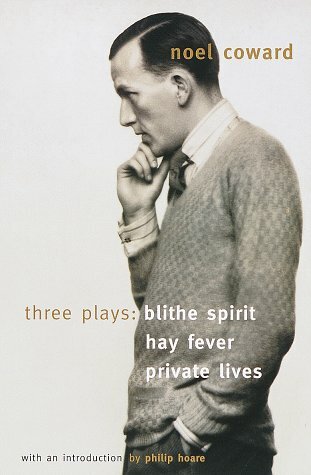 Hay Fever, Blithe Spirit, and Private Lives (1930) have proved to be the most durable of his comedies, along with nine short plays presented as Tonight at 8:30. In each, characters demonstrate the combination of perpetual role playing, cool hedonism, and energizing self-absorption.